Everybody’s trying to explain how SB 1 bails out the Chicago Public Schools (CPS) pension system, and why the numbers are all over the board. Greg Hinz of Crain’s, who’s been really good at trying to make sense of this mess, wrote an article last week, and another one here, trying to decipher the fuzzy math. I thought I’d add my 2 cents worth. The Chicago block grant ($250 million) has nothing to do with pensions. This is money that the state has been giving to Chicago for years for things such as transportation, ESL programs and Special Ed. Other districts have to apply for reimbursement on these items, but Chicago has been given this grant without having to itemize its costs. I’m not saying it’s right, but we can’t blame the CPS block grant for the pension mess. This is “old money”, and is in SB 1. There’s a “hold harmless” provision in the bill that provides that no district (including Chicago) will receive less under the “evidence-based model” than it received in the 2016-2017 school year. However, SB 1 also includes CPS’ $221 million in “normal” pension costs in its “hold harmless” even though the state doesn’t currently pay for its normal cost. Each district is assigned a “local capacity target”, which is the amount the district is expected to contribute toward its schools through its property taxes. Its level of state funding is determined to a great extent by how much it can provide in local resources (remember this, because it’s important for our current discussion). Tier 1 districts are the least well-funded districts. Tier 1 districts will receive 50% of their “funding gap” (the amount they’re currently receiving as a percentage of their “Adequacy Target”), and will receive 50% of all new state dollars. Tier 2 districts are all Tier 1 districts plus all districts with a Final Percent of Adequacy less than 90%. In aggregate, districts in Tier 1 will receive 50% of new State dollars (this is also important). Districts in Tier 2 (including Tier 1) will receive 59% of new State dollars. Tier 1 districts get the first tranche of money from the evidence-based funding model. OK, for purposes of the pension discussion, I’ve given you all you need to know and saved you the trouble of reading the 511 pages which constitute the bill. As stated above, CPS gets $221 million in its “hold harmless” for its normal pension cost. No other district in the state gets its pensions included as part of the funding formula. I don’t have a problem with having all districts treated equally as far as how normal public pension costs are paid, but it shouldn’t be included in a school funding bill. Let’s do pension reform and take CPS’ normal costs out of this bill. So, if you’re keeping score at home, to this point CPS is getting $471 million that other districts either don’t get (pensions) or have to apply for before getting reimbursed (block grant). We now need to factor in the underfunded portion of the CPS pension. As I stated in a previous post, Chicago is 100% responsible for its current underfunded situation, and I for one see no reason why it should be rewarded for its profligacy. This is where the “local capacity target” comes into play. CPS isn’t actually getting any new money for its legacy costs, but in order to ensure that CPS became a Tier 1 school district instead of Tier 2 (which it was under the original version of the school funding bill, HB 2808), the proponents of SB 1 decided to artificially reduce CPS’ local capacity target (the estimated amount that CPS has locally to spend on education) by its unfunded pension liability. This makes it seem that CPS’ local capacity target is lower than it actually is. As a result, CPS became a Tier 1 District that is 62% adequately funded. It is estimated that this artificial reduction in the CPS local capacity target results in a $30 million increase for CPS in new funding through the Tier system. (Also included in SB 1 is a provision that if a district’s PTELL EAV is lower than its regular EAV, then the local capacity target is calculated using the PTELL EAV, making it look like a district is in even worse shape. That calculation is outside the scope of this post). The important thing to remember is that because of the adjustment in local capacity that came about because CPS messed its own bed from 1995 to 2014, it gets a higher priority on distribution of new state money, and gets its share earlier in the process to a greater percentage of that money than it would otherwise get if it stayed in Tier 2. If you’re still reading at this point, I applaud your tenacity. Go get a cup of coffee or walk the dog, then come back for the next post comparing SB 1 with the bill that will probably be the end result of the Governor’s amendatory veto. This entry was posted in Education, Public Pensions, Public Sector Unions and tagged Chicago Public Schools, Crain's Chicago Business, Public Pensions, SB 1. Bookmark the permalink. 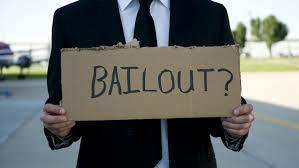 3 Responses to Does SB 1 Bail Out the CPS Pension System? You Decide.